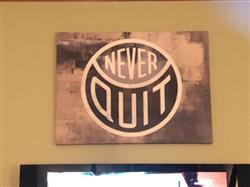 "Never Quit" by IKONICK. If you quit, you'll never know. Hang this canvas art in an area that inspires you. A daily reminder of where you're headed. Complete your vision board with this daily reminder to hustle, grind while modernizing any work/office space. Can’t wait til we close on our new house and I’ve got more wall space!